Snapchat is tweaking its platform in response to backlash against its newly redesigned app. On Tuesday, parent company Snap (SNAP) announced a new update intended to make it easier for users to view content they want to see. The move comes on the heels of a Change.org petition that asked the company to remove the redesign. It has received more than 1.2 million signatures. Many users called the new app confusing to navigate. "We hear you, and appreciate that you took the time to let us know how you feel. We completely understand the new Snapchat has felt uncomfortable for many," the company wrote on Change.org, in response to the petition. 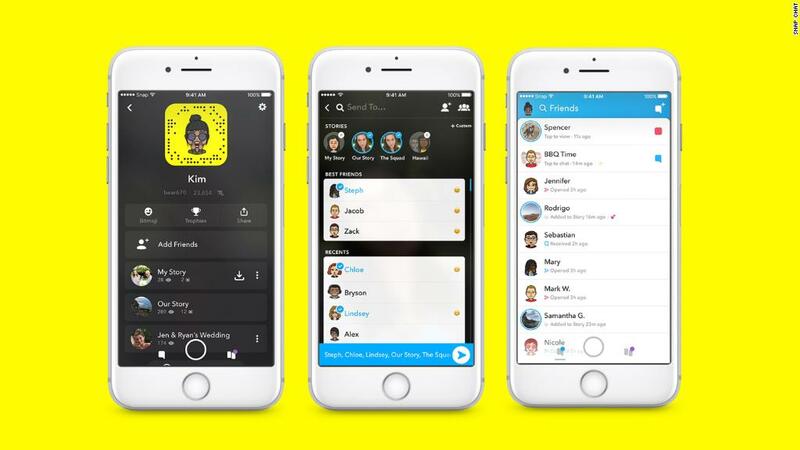 In the post, Snapchat said it will soon roll out tabs on iOS in the app's Friends and Discover sections to make it easier for users to find Stories, which are photos and videos shared by users that disappear after 24 hours. Users will be able to sort Stories, group chats, and subscriptions, to enable "further customization of the app." Additional details about how the update will work are unclear. Tabs will be available on Android in the coming weeks as well. In November, CEO and founder Evan Spiegel acknowledged Snapchat can be difficult to understand and announced a redesign was in the works. While the effort was a part of an effort to attract new users, the company has faced criticism that the new layout makes it harder to use. The app previously featured content from friends, publishers and celebrities on one page. Now, there's a designated page for publishers and celebrities, and a separate page for friends. Users have complained about this change, and said it's also more difficult to find posts from friends you communicate with less frequently. On the Friends page, Snapchat now features users you've interacted with most recently higher up on the screen. "Our design and engineering teams are constantly monitoring the rollout of the redesign and making improvements based on what we learn from our community and their usage of Snapchat. These adjustments to our products will continue over the next few quarters as we continue to optimize the application," Spiegel said on a recent earnings call. However, last week, Spiegel said that some complaints about the update actually "validate those changes." "One of the complaints we got is, 'Wow, I used to feel this celebrity was my friend and now I don't feel like they're my friend anymore,'" Spiegel said on stage at the Goldman Sachs Technology and Internet Conference. "Exactly. They're not your friend." It's rare that social networks make changes to major redesigns based on user feedback. In 2008, Facebook dramatically redesigned its site, sparking backlash. Although many users joined groups on the platform opposing the new layout, Facebook did not change it back.